At the start of 2009 a small group of people met in a pub in Bristol and were introduced to the real crisis in Sierra Leone. They resolved to not just raise money to aid the people of this poverty stricken country, but to try to actually do something about it themselves. This was the start of the charity ‘Alive & Well’. We are a group of like-minded individuals all of whom want to make a difference. We are based around the West Country, with our members coming from a wide range of professions and backgrounds, all having the unifying wish to make use of the advantages and opportunities they have had to help others. 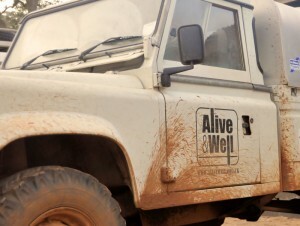 To that end we formed the charity Alive & Well with a clear and simple purpose, to set about providing fresh water wells in the SE region of Sierra Leone, in villages where there is desperate need. Contaminated water is the single biggest killer of young children in this area. We also intend to create a legacy, by leaving in the country the drilling rigs that we buy and ship over so they will be permanently available to the communities in the region. We will train local people how to use the equipment correctly and safely, and support the working crews in order to perpetuate the ongoing strategy of bringing clean water to villages where there is none.